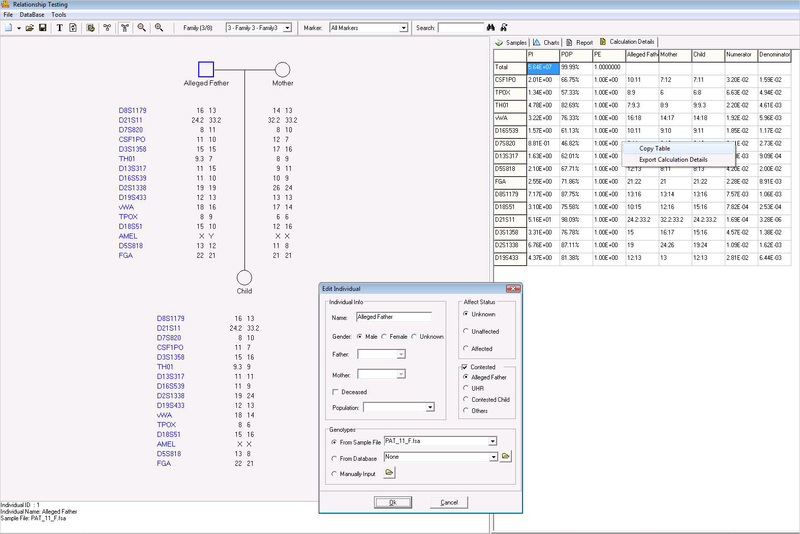 GeneMarker® HID human identity software has a linked Relationship Application which automatically: draws pedigrees while providing accurate and rapid comparison of STR profiles from family members; verifies paternity exclusion or inclusion by identifying allele conflicts (between parents/child(ren) or siblings) with results in a table and pedigree graphic; and where possible, deduces missing parent profile based on offspring allele calls. There are two options for relationship statistics: classical paternity trio calculations (using the PI formulas of AABB Standards for Relationship Testing Laboratories, Appendix 8) with PI, PE and CPI, CPE in an exportable table; or identity-by-descent, providing likelihood ratios of related versus random individuals in a population. Both methods in GeneMarker HID software use the mutation rates of AABB and pre-loaded allele frequency tables for loci in Identifiler®, Minifiler®, PowerPlex®16 and PowerPlex®ESI/ESX. GeneMarker HID software is a user-friendly expert system compatible with all ABI®PRISM 310-3100-3730-3500 and all CE file formats (.fsa, .hid, .sg1, .scf). 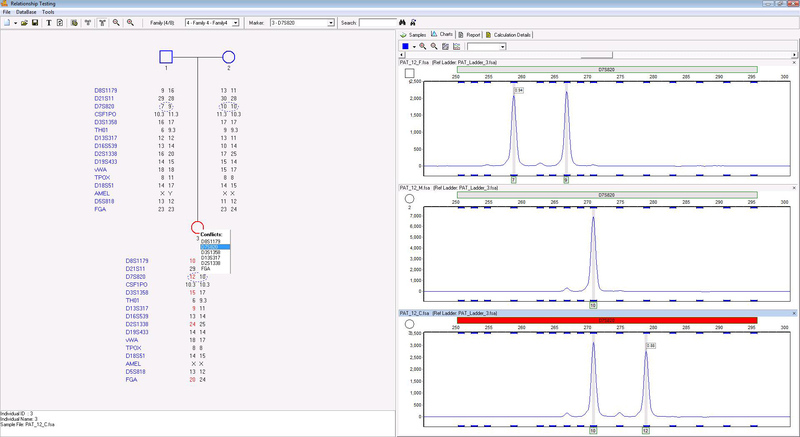 Population specific allele frequencies can be easily imported into the program if needed. Family Group tool automatically draws paternity trios. Allele conflicts are linked to the electropherograms for immediate identification in paternity tests. This example shows a typical paternity exclusion case. 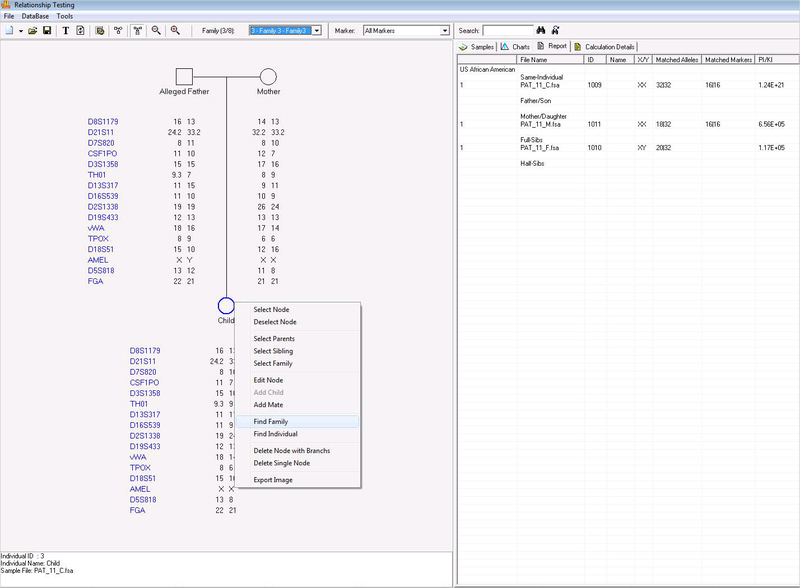 The Alleged Father is selected using the Edit Individual dialog box and the appropriate population in the allele frequency tables. The Calculation Details tab provides an exportable table with the PI and PE for each locus and the combined values for this typical paternity inclusion case. The results are calculated using trio calculations of AABB. If one of the parents is missing the motherless equations are used to calculate PI and PE. The ‘Find Family' searches the database for any potential relatives and calculates the likelihood ratio. This feature may be used with (as in the figure above) or without known relatives in a pedigree drawing. It uses identity by descent to compare the file in question with all files in the relationship testing database.